Here's another table built from my plans. This customer paid a little extra for high quality materials. He wrote: "Thanks for the great plans. Everything went smooth as silk. Total construction cost was $433.25. A bargain taking into account the quality of the materials and what a table costs if you buy it from someone. "Looking back we could have shaved about $40 on various items. It was a learning process. I can't wait to build another one! It has been a long time coming. 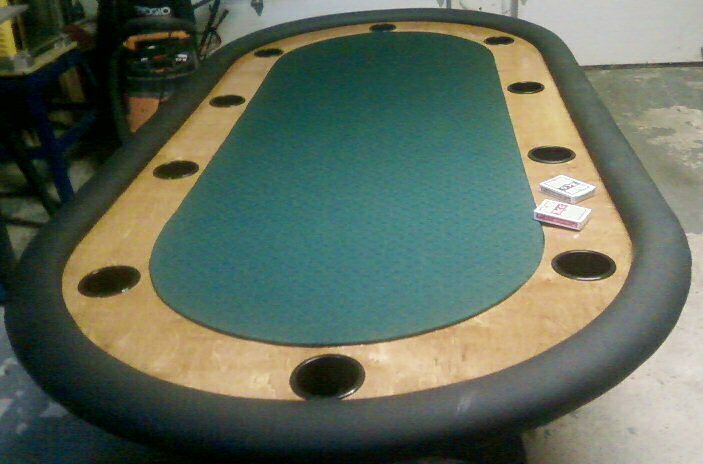 Our original store bought poker table finally croaked. 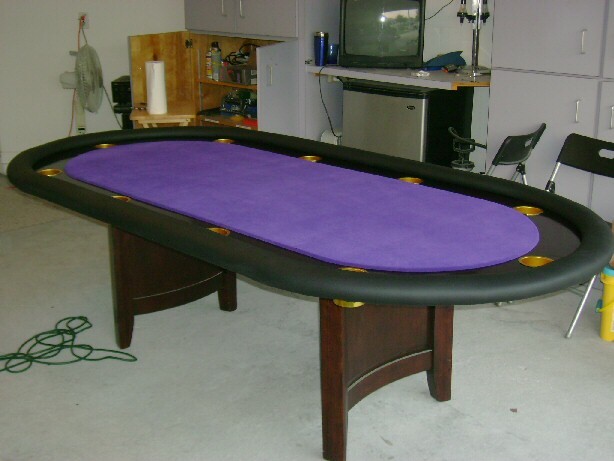 So our group leapt into action and embarked on an adventure to build our own custom poker table! It was a fun project and we are really happy with the result!" "I bought the cup holders from here. They are a little bit more than some of the cup holders out there, but I like them because they have a larger inside diameter for my beer glasses. 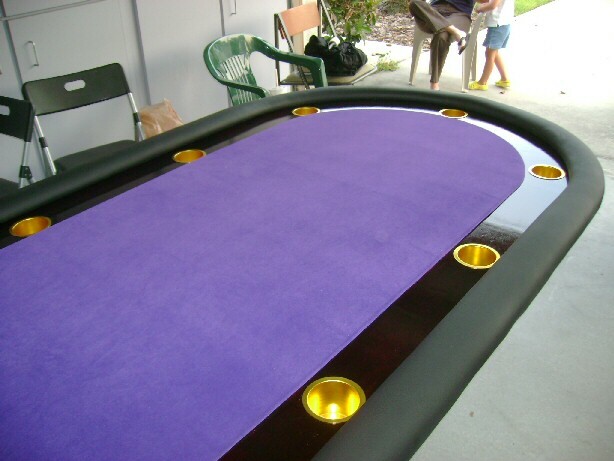 "I found this web page, which has the most comprehensive list of vendors for poker table supplies and accessories. "I found the legs by accident. I was at a Rooms To Go furniture warehouse outlet in Tampa, Florida. They had a scratch and dent area and I saw a table with nice legs, bought it for $50, and just mounted the legs to the poker table. You might want to suggest that in your packet. A lot of furniture stores may have a table that is so beat up that they would be happy to just get anything for it. And the legs are what the poker table builder really wants. The top is superfluous. "Thanks again. Your plans are worth every penny. 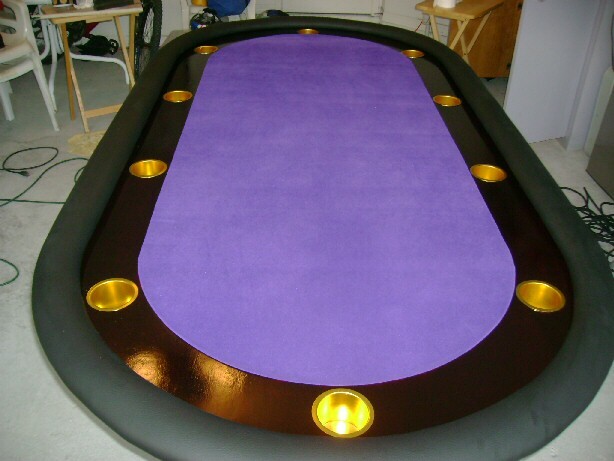 The satisfaction of building your own table is priceless!"